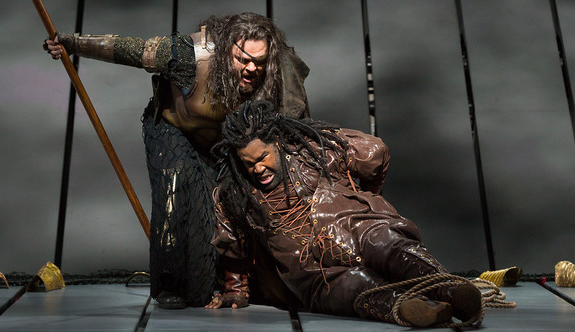 With a clank and a clatter, the Met revives Das Rheingold. Alberich (Eric Owens) in Scene Four of Das Rheingold. The Robert Lepage production of Wagner's Ring has returned to the stage of the Metropolitan Opera. Yes, the "Machine" is back, that multi-million dollar unit set with 24 rotating planks that serve as acting area and projection surface for Mr. Lepage's digital scenery. And for the first half of Das Rheingold on Saturday afternoon, things were going pretty well. Mr. Lepage's high-tech story-book approach proved surprisingly engrossing, carried along by the brisk conducting of Fabio Luisi. At the end of Scene Two, one of the rotating planks that make up the acting and projection surface of the 45-ton set) appeared to jam. (A statement from the Met press department said that the stop was ordered.) This interrupted an elaborate maneuver where the device rises from the stage, forming a sideways helix that (acrobats pretending to be) Wotan and Loge traverse on their way to visit the underground realm of Nibelheim. The rest of the performance went relatively smoothly, helped by the hard work of associate director Neilson Vignola and some new blood in the cast. Their efforts were already visible in the opening scene, as the Rhinemaidens flirted with Mr. Owens' Alberich, whacking him with their tails as they swished through the digital river. This opening stage picture remains spectacular and almost justifies the expense and headaches of this troubled production. Mark Delavan proved an almost likeable Wotan, with a burry baritone that caressed the vocal line. He was helped by a costume change: this Wotan has an eye-patch replacing the moussed wig that hid half of the god's face. The result: a more expressive performance. He struck sparks with Stephanie Blythe's redoubtable Fricka, and engaged in hammer-and-spear play with Dwayne Croft's Donner. Although Mr. Delavan had to occasionally battle to be heard over Mr. Luisi's unsubtle conducting, he acquitted himself in his final address to Valhalla, delivered with ringing tone. Franz-Josef Selig (Fasolt) and Hans-Peter König (Fafner) were an engaging pair of giants, although the menace of these hard-working brothers is hampered by the fact that they remain high up on the Machine, and thus no danger to the gods down below. Mr. Selig molded his vocal line with great beauty in his short ode to Freia (Wendy Bryn Harmer) the goddess promised as payment for the building of Valhalla. Mr. König was a resonant, firm Fafner. Mezzo Meredith Arwady was a memorable Erda. Stefan Margita provided vocal fireworks as the trickster god Loge. This character tenor demonstrated a full upper and lower range, using the latter to inject meaning into the long Scene II narration. This was a fully engaged performance, and he looked completely secure standing on the Machine, his feet in digital flames and a safety line attached at the back of his costume. He looked to be the only singer on that contraption who wasn't worried about its safety. Safety. That, in a word is the problem with the Lepage Ring. Instead of getting drawn into the story, one sits waiting for an accident to happen with the giant set, for a plank to slip or for a grinding creak and crash that signifies something worse. 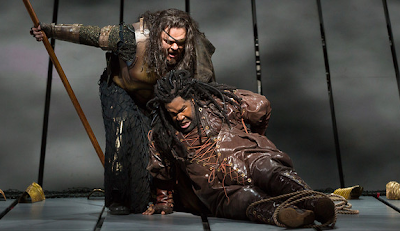 When Wagner conceived Der Ring des Nibelungen, he pushed the edge of what opera houses were expected to achieve. However, the great composer might have blanched at the idea of opera singers working without a net, or of scenery that, despite the best efforts of the Met's technical crew, always manages to steal the show.